I'm just back from a meeting of the Ageing Well Network - an interesting and innovative forum for discussing future options for Ireland's ageing population. The discussions are - as always - wide ranging and informative. They are also subject to the Chatham House Rule: so I won't/can't go into any details. One sidebar, non-AWN conversation that I did have (in the bar, as it happens!) was about cross-border shopping, which I addressed in a recent post. I was leaning towards giving the shoppers choice and letting them spend their money where they get the best value - even across the border in Northern Ireland. However, others felt that people should support their local retailers, even going so far as to encourage people to buy Guaranteed Irish goods. But I think that a 'Shop Local' strategy is the last thing we need - that way impoverishment lies. I prefer the 'Made on Earth' strategy recommended in this post, and it's focus on the benefits to shoppers, workers and investors everywhere from the true globalisation of trade in goods and services. Which just might get more attention now that casino capitalism is in recovery. I guess it's down to one's political preferences. Take the World's Smallest Political Quiz and see where you stand in the political scheme of things. 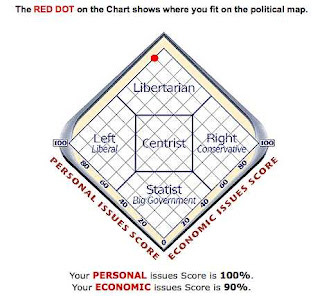 My score (image above) clearly puts me in the Libertarian segment. No surprise there - I don't get a 'perfect' Libertarian score for the simple reason that I'm something of a 'minarchist' - I do think there are certain roles that require Government intervention. Like addressing the extreme impoverishment that currently affects certain groups - especially the elderly. Though I hope we will have less need for intervention in future generations of elderly people if we allow the free market to deliver the incomes and wealth that will protect us from poverty in old age. And of course we shouldn't forget that price cuts are as good as income rises for people on fixed incomes - and if shopping across the border delivers that for otherwise cash-strapped Irish citizens (elderly or otherwise) then they should be free to do so. Ha!Yeah, cos the DB pension I used to have being forcibly replaced by a DC pension won't see me with a stale rolo and empty chewing gum wrappper at my retirement, right?